Sunday April 24th 1881 It was very warm today for the season. I did not got to church in the morning but let Bridget go and she took May. I was busy till noon about the house. John & Hatt and Win were over in the afternoon and stayed till nearly night. I played on the piano all the evening. Monday April 25th 1881 I hurried through my morning work and went over to see Hatt and help her can her maple molasses. As soon as we got dinner over both went up to help Win sew. I stayed there till after supper, stopped to see Henry as I came home. Wrote a letter to Charlie in the evening. 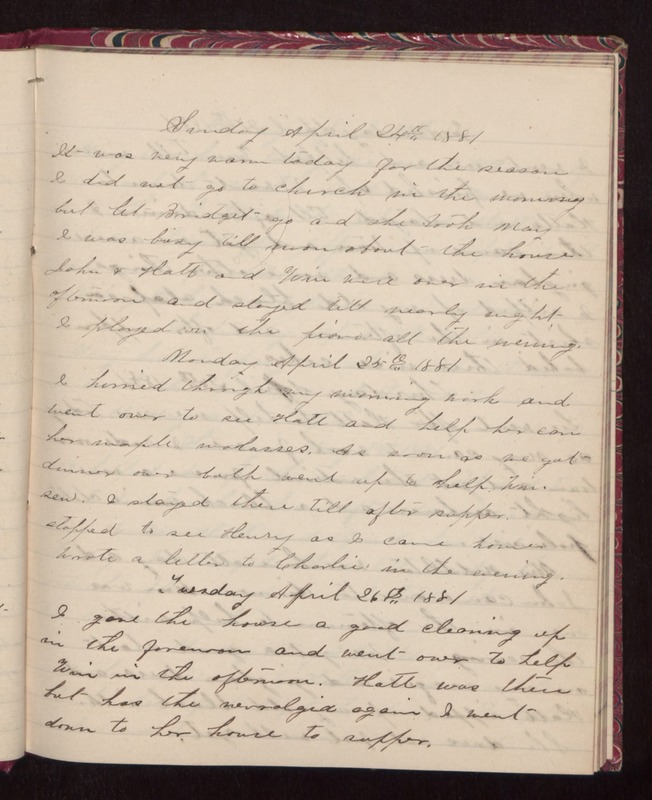 Tuesday April 26th 1881 I gave the house a good cleaning up in the forenoon and went over to help Win in the afternoon. Hatt was there but has the neuralgia again. I went down to her house to supper.